The Starter bench meters include basic meters to premium performance products with advanced functionality, for measuring pH, conductivity, salinity, total dissolved solids (TDS), and oxygen reduction potential (ORP). Intuitive Software that Powers the Starter Series—Intuitive software and a well-organized display work in tandem to make operating the Starter Series a simple and straightforward task. Functional Design for Easy Operability—With five clearly marked input keys and built-in or stand-alone electrode holders, operating the Starter bench meters is a convenient process. Reliable Calibration for Accurate Results—Starter bench meters track the accuracy of the calibration process right on the display, so that you can measure with peace-of-mind, knowing that your results will be highly precise. 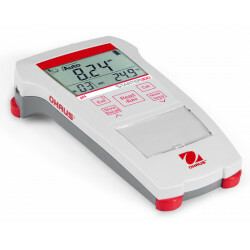 Accurate Water Analysis Results Anywhere and Anytime You Need Them OHAUS ST10 Starter pen meters are the economical option when you are simply looking for meters that will provide accurate measuremen.. Accurate Results Anywhere and Anytime You Need ThemStarter pen meters are the economical option when you are simply looking for meters that will provide accurate measurement with no restriction.Standa..
OHAUS Starter 300 pH portable kit including ST300-B kit and ST320 pH electrode. ST300-B kit includes:ST300 meter AAA battery x 4 electrode clip IP54 seal components wrist strap portable ba..
OHAUS Starter ST2100-B pH Bench Meter If you are looking for a cost-effective, reliable pH bench meter, Starter 2100 is the right choice for you.With the attached quick guide, five clearly marked..
OHAUS Starter ST2100-E pH Bench Meter Kit If you are looking for a cost-effective, reliable pH bench meter, Starter 2100 is the right choice for you.With the attached quick guide, five clearly ma..
OHAUS Starter ST2100-F pH Bench Meter Kit If you are looking for a cost-effective, reliable pH bench meter, Starter 2100 is the right choice for you.With the attached quick guide, five clearly ma..